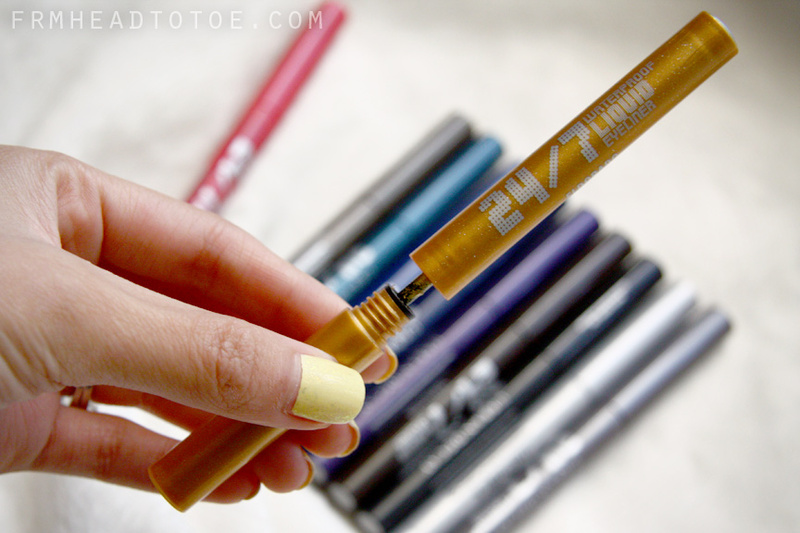 Ever since featuring the new Urban Decay 24/7 Waterproof Liquid Eyeliners ($18) in my last Hits & Misses video, I've gotten a lot of requests to fully review the line and show swatches of the collection. 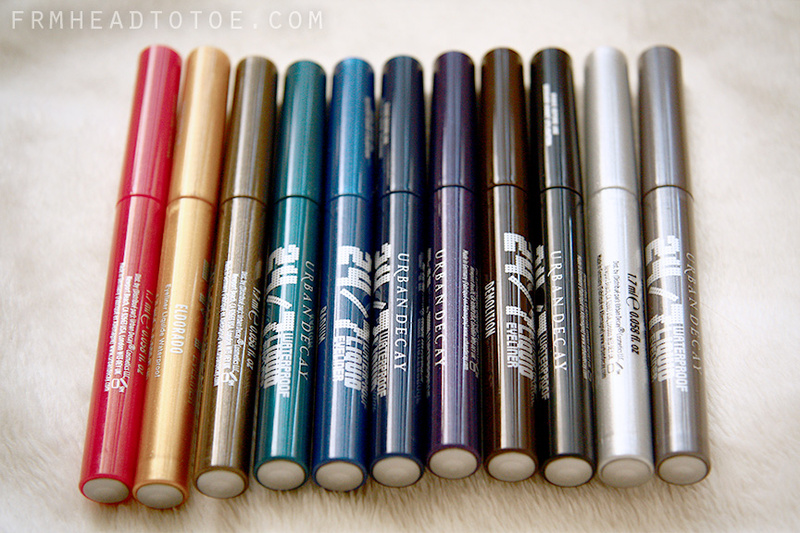 As followers of my blog know, I am a forever fan of UD's 24/7 pencil liners so I had a lot of anticipation for these eyeliners. Structurally, they are very slim and study. The cap twists off and the handle is the longer end while the product is in the shorter, slightly thicker end. I'm mentioning this because I usually find myself thinking the opposite and open it upside-down with fear of the product running out. The brush is in a thin wand is very fine and a length that is good for drawing long, even lines but may take a bit of practice to give perfect control since the brush does have give to it. The most important thing I can say about swatching and using these liners is that you MUST SHAKE them up before use. When I first swatched, they came out weak and watery and not at all the quality that I expect from Urban Decay products. When I shook, I realized it has a metal ball in it to help mix the product like nailpolishes do. After shaking, the product was nicely opaque and excellently pigmented. The eyeliner dries totally waterproof with a glossy finish. Overall, I love the variety of colors available and how smooth and pigmented they are. They are also killer long-lasting and waterproof and I'm guessing 98% of the population will be completely in love and satisfied with these. You can wash with the strongest soap and these will not rub off unless you grab an oil-based makeup remover. When testing these with false lashes or monolidded, I did find that they did disintegrate slightly on my inner eye corners by the end of the day (as does just about every eyeliner out there) but for the most part performed very well. Those with higher creases will likely not run into this problem. On my upper lash line I particularly adored Sabbath (deep navy blue) because it looks nearly black but not as harsh and has an eye-brightening effect as well. I give these eyeliners a very hearty A-. Definite recommend. Disclaimer: Thank you to Urban Decay for generously gifting these eyeliners! This post is not sponsored. wow, those colors sure are thick and bright. 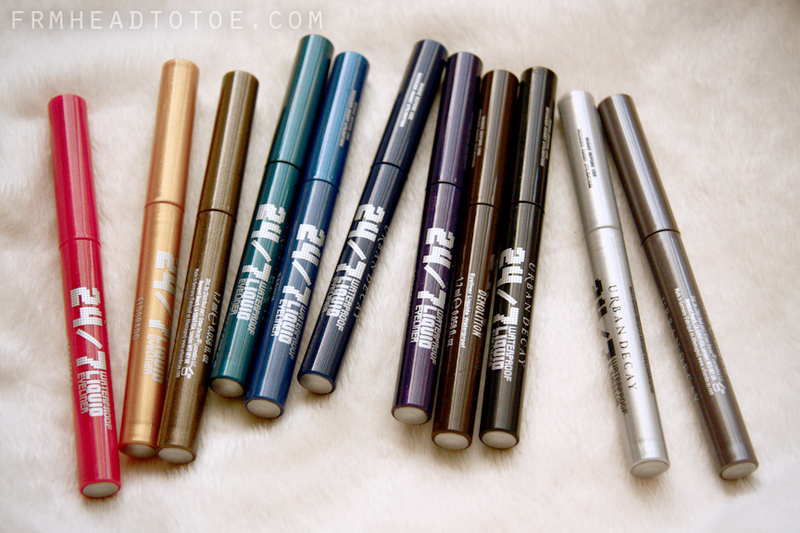 must try these after I use up the couple eye liners I currently have! thanks for the review. i love all the UD stuff you've reviewed! The pencil liners now the liquid, the colours are gorgeous! It's so sad that they're not sold nationwide in australia...i would love to get my hands on these! I haven't try this liquid liner, but after see your swatches and review now I decide to have it. Thanks! I love these liners! Must try them! Those colors are beautiful and bright! Love them! A more reason to order a few more things from UD! haha! Great post! GORGEOUS colors! i am so tempted to buy them all! Love your reviews! They're always sooo detailed and very helpful! winner! these are crazy pigmented and i love how reflective they are! Great swatches. 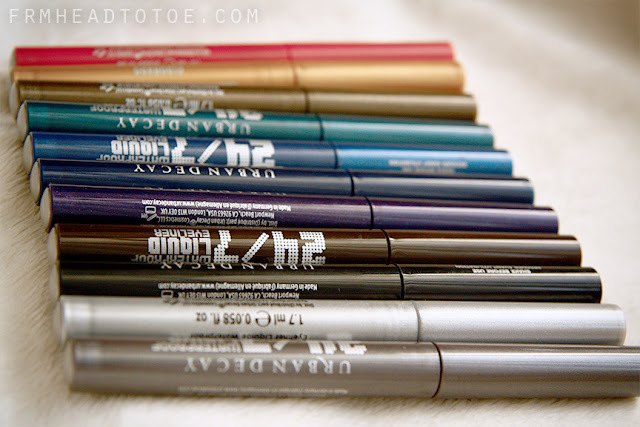 I have to try these liquid liners they seem like very easy to use and the colors...wow! Great colors! I love the hot pink one so much! However, I'm not a huge fan of liquid eyeliners. I find it very hard to draw a fine and precise line. wow Jen! the colors are all pretty...I'm in love with all of the colors! hahaha..thank you for the swatch, UD really never fails to amaze us right? Thanks for the review and swatches... gonna have to pick up a few. Oh my Gosh, I'm so sad that liquid eyeliner look so terrible on me. These look fantastic and I'm looking forward to see them on you. these are awesome i would have to buy them all hehe! Love these! I would probably purchase a few in the more unexpected colors (like the hot pink, for instance). been meaning to check these out. very helpful review. omgeee!! 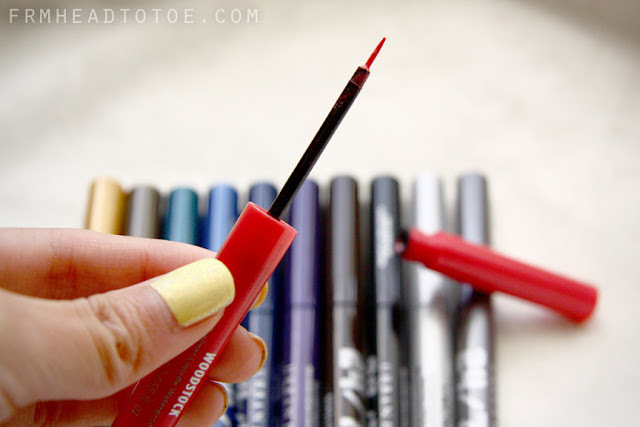 I was going to stop buying eyeliners for a bit because I am truly an eyeliner hoarder but I love the look of these! I want them all. love your recent post! you have to swear you swear by them.. i actually am afraid to use it just because it might dry up and get "crackly" if you know what i mean. i usually get that with waterproof eyeliner. keep us posted w more tutorials! i don't like liquid eyeliners. I bought Sabbath because I loved it.. I also really like Smog and Retrograde but I have them in pencil eyeliner form. I loved your review so much you convinced me to buy woodstock. I can see I'm not the only one of your commenters who is a fan of this color. I would love to see what look you would do with it! great review! would you say these eyeliners are similar to the MAC Superslick liners? The colors are pretty similar, but i noticed the MAC one gets clumpy on the eyelashes. This is really a superb post! I like this topic. This web site has a lot of advantage! I identified a lot of fascinating points from this internet website. It helps me in numerous techniques. Thanks for posting this as soon as again. Cameo in Michelle Phan's "Catch My Heart" Video! August Hits & Misses: Drugstore Edition!